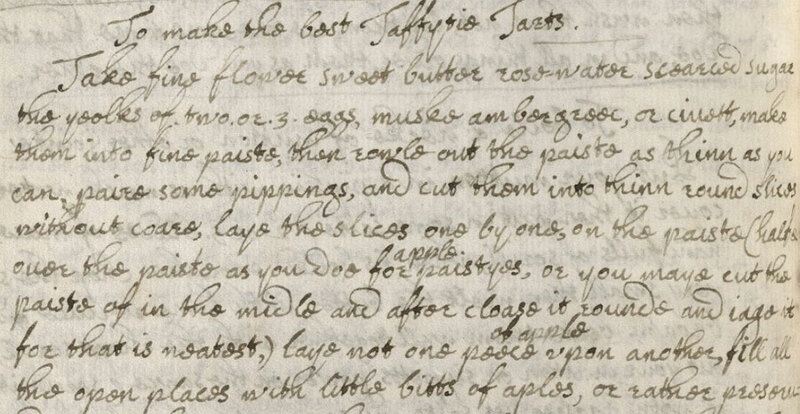 Food historian and The Great British Baking Show winner Mary-Anne Boermans writes about piecing together 17th-century manuscript recipes for Taffety Tarts and shares her own recipe adaptation. My passion for many years has been traditional British recipes and, for the last decade or so, those recipes appearing in handwritten household manuscripts: recipes that were recorded and passed on and passed down through families and friends. These recipes are now appearing online, thanks to the wonder of the internet, as institutions such as libraries and record offices embark on ambitious digitizing programs that both make their holdings available to a much wider audience and help to preserve them from damage through overuse. I read a lot of old recipes; over the years it has totaled hundreds of manuscripts and tens of thousands of recipes, and if there’s something I’ve had confirmed to me as a result, it’s that there’s pretty much nothing new under the sun. In the UK, we’ve only been recording recipes for just over 600 years and, for the most part, if, as a cook, you think up what you believe is a new recipe combination, chances are someone, somewhere, has done it before and written it down — and eventually it will turn up. So, while I’m reading these manuscripts, if something catches my eye and causes me to highlight a recipe in my notes, it has to be something out of the ordinary. So it is with Taffety Tarts. I first read a recipe for them in a manuscript in the Wellcome Collection: ‘Interesting’, I thought, ‘unusual name. I’ll come back to this one later.’ I made a note and moved on. Then I came across a second recipe, and then a third. Before long I had thirteen recipes across multiple manuscripts, decades, and, to be honest, spellings. Capricious orthography aside, this many recipes indicated that they were very much a ‘thing’ in seventeenth-century food fashion. Trying to define what exactly this ‘thing’ was, however, was more complicated than I first imagined. The best generalization I could manage at the time was that they were apple pastries. Each recipe seemed to have its own idea about what was important about the finished dish and so concentrated on that particular aspect in great detail. One insisted that apples were cut in semi-circles and laid like roof tiles into the tart; another was firm that the apples be cut in eighths then sliced, to make shapes closer to an actual roof tile. Some cooked the apples down to a pulp, and another dyed the pulp to make different colors, using wine, cochineal, and lemon juice. Tarts were round, tarts were square, sometimes iced, other times un-iced, occasionally open or at other times with a pastry covering. One recipe was concerned solely with the proper making of the pastry and didn’t mention fillings at all. There seemed to be very little common ground. Some of the recipes were identical, word for word, but attributed to different people. It was difficult to know whether that meant it was the ‘true’ recipe or whether this was a close group of friends that were sharing their favorite pastries, and their manuscript books had all miraculously ended up in the same 21st-century archive. It was like having thirteen pieces of a jigsaw and no picture to follow–no idea whether a recipe was one of the important bits, or just a dull bit of sky. Robert May. The accomplisht cook, or The art & mystery of cookery. London, 1685. M1394. Folger Shakespeare Library. 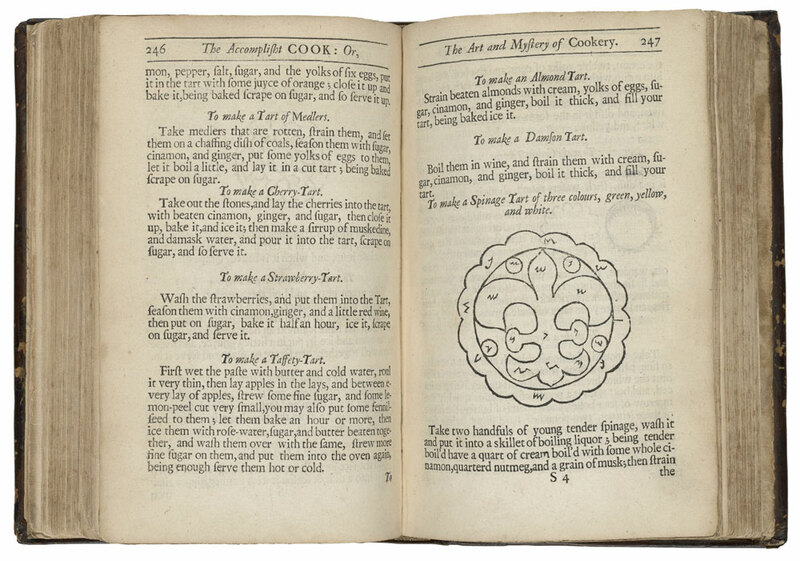 For help, I turned to Robert May, whose masterpiece cookbook, published in 1660 in his old age, not only chronicled food fashions for most of the seventeenth century, but also influenced cooking for decades to follow. His recipe detailed apple pastries that were seasoned with sugar and lemon peel, encased in delicate, thin pastry, which were iced when cold. Helpful and yet not helpful. No indication of which type of pastry — ‘ shortcrust or puff ‘– and no mention of shape. Frustratingly, for a man who was such a cookbook innovator by including diagrams for his many pie and pastry creations, he included nothing for the design of Taffety Tarts. In the end, after all of this searching to find a definitive recipe for my book about traditional-but-lost British recipes, I chose a recipe that sounded the most interesting and moved on, but there was always a slight rankle in the back of my mind that I didn’t quite solve the mystery. Robert May. 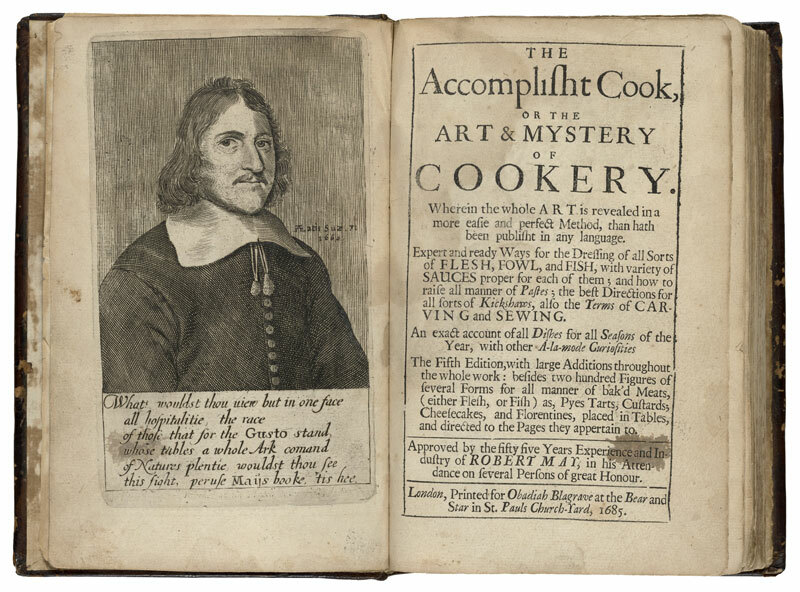 The accomplisht cook, or The art & mystery of cookery. London, 1685. M1394. leaf S3 verso (page 246) || leaf S4 recto (page 247). Folger Shakespeare Library. Imagine my delight, then, to be able to revisit this culinary puzzle when I learned of Shakespeare’s World, the volunteer project to transcribe the Folger Shakespeare Library’s manuscripts. The volunteer scribes from this project had discovered yet more Taffety Tart recipes. Although fewer in number than those at the Wellcome Collection, they provided the much-needed missing details on the presentation of these delicate pastries as well as the variations possible. Firstly, this recipe title allows that the filling can be of fruit other than apples. It then goes on to detail the pastry’s construction and appearance: thin, delicate squares of pastry are filled on one half, then folded over to make a slim rectangle. This recipe is unusual in that it is the second one to appear in this volume. No other manuscript I have come across has ever had more than a single recipe for Taffety Tarts. We get a lot from this recipe: an enriched pastry perfumed with musk/ambergris/civet; round slices of apple laid in a single, thin layer, with the middles and any gaps filled with white sweetmeats; the whole strewn with perfumed sugar; the shape of pastry rectangles neatly cut with a jagging iron; that they must be baked pale and flat, and if they start to puff up, instructions to press them down with a wooden peel; and to ice them with royal icing. It is almost a ‘complete package’ in terms of the details supplied, needing only to have been dated and include a drawing of the pastry shape in order to complete the picture. 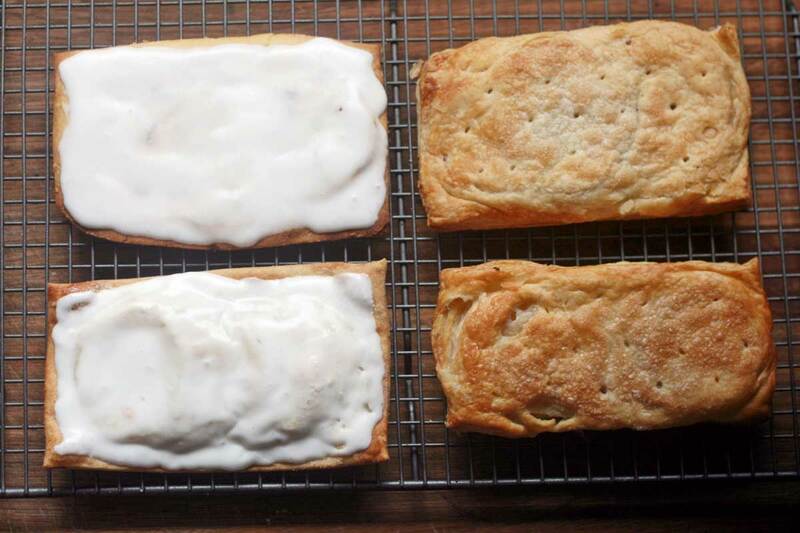 It might not be the jigsaw box cover image, but it’s definitely the four corner pieces of the puzzle, because it reveals that what this Jacobean pastry most resembles, with its thin, rectangular shape, fruit filling and icing is… a pop-tart. A seventeenth-century pop-tart. Thoroughly delightful and at the same time neatly bringing things full circle to my initial assertion that there’s nothing new under the sun. 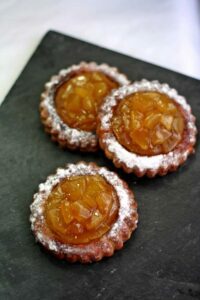 These finds, together with the details from the recipes in the Wellcome Collection, provided sufficient information to create an entry for Taffety Tarts in the Oxford English Dictionary. I am extremely proud of being even just a small part of such a collaborative project, especially across such huge geographical distances, brought together through technology, and look forward to equally successful collaborations in the future. At the request of multiple readers, Mary-Anne Boermans has shared her own recipe for Taffety Tarts, based on pages 228-229 in V.a19 (see manuscript image directly above). Peel the apples and remove the cores with a corer. Cut the apples into round slices. Cut the puff pastry sheets into 4 inch/20cm squares. Place two apple slices on one half of each puff pastry square. Do not overlap the slices. Chop the leftover pieces of apple small and use to fill in the middles of the slices and around the edges. You are aiming for a single, thin layer of fresh apple. Alternately, fill the holes from the cores with teaspoons of light fruit preserves such as pear, quince, apricot. Sprinkle with fine sugar and grate over some lemon or orange zest. Dot with small pieces of butter (optional). Brush the edges of the pastry with water and fold over. Press the edges together to seal. Chill the finished pastries in the fridge for 30 minutes. Heat the oven to 400°F/200°C/180°C Fan. Remove the pastries from the fridge and trim the edges neatly. Use a sharp knife to get a clean, crisp cut. Poke steam holes in the top of the pastries with a skewer. Arrange the pastries on the baking sheet. Lay a sheet of parchment lightly over the top of the pastries and stand a metal cooling rack over it. This is to prevent the pastries from rising too much during baking. The parchment sheet is to prevent the pastries from getting stuck to the rack. Bake for 20-25 minutes until the pastry is crisp. Check the undersides of the pastries to ensure the pastry is cooked. While the pastries are cooking, whisk together the icing ingredients until they form a smooth, pourable mix the consistency of cream. When the pastries are baked, remove from the oven and spread or pipe the icing onto the hot pastries. Turn the oven off, then return the pastries to the still-warm oven for 10 minutes, to set the icing. Mary-Anne Boermans Boermans is a food historian and former finallist (Season 2) and Winner (Christmas 2016) of The Great British Baking Show. She is also an award-winning author of two books of historical British recipes, Great British Bakes and Deja Food. She maintains two recipe blogs; timetocookonline.com and DejaFood.uk, devoted to resurrecting old recipes to enjoy today. Mary-Anne lives with her family in Worcestershire, UK.